Astigmatism is a vision problem in the curvature of the cornea which means that the eye is unable to focus clearly on near and distant objects. This is because, instead of being round, the cornea is misshapen at both poles, resulting in different radii of curvature in the main axes. 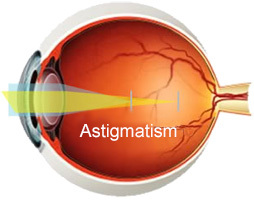 The most common symptom of astigmatism is the perception of distorted images. However, it can often cause headaches or eye discomfort. The symptoms may also differ or may not even affect the person's vision depending on their age and the degree and type of astigmatism.